Hi, this is my first thing here. You guys are amazing! This is for a game, I will make many more of them in many colors. I'd like to hear your crits before jumping into new one. 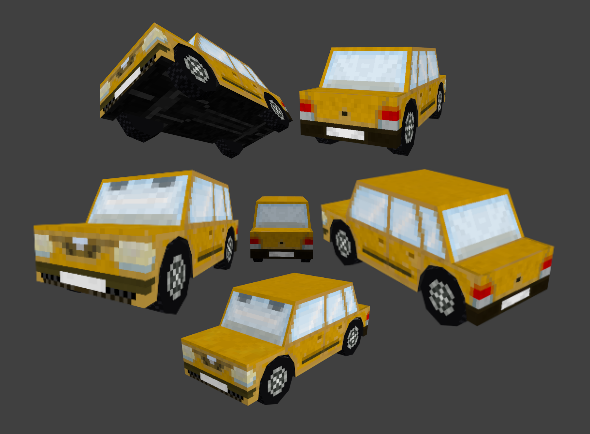 My first "3d lowpoly model that has pixelated textures" I don't know how to call it : ) Forgive the noob. Why is the first thing I think of GTA IV? Anyway, the model itself is cute. I think it's the texturing that needs work. Try to define your light-source and make planes closer to that light-source, you know, lighter. Assuming this car has a metal shell like any normal car, consider adding some edge highlights as well. It should help define sharp corners. And for some reason, it looks like you saved the texture as a JPEG, unless all that noise is intentional. Excuse me for tossing all this terminology around, I tend to do that. Anyways, the part I'm most confident is the under of the car, what do you say does that part also needs re-painting? I'm not sure how to use light on this? Use the pixelled texture and project light on it than export the lighted textures, and use them as textures? Umm how about adding a few more details such as a license plate, a muffler, and a windshield wiper?